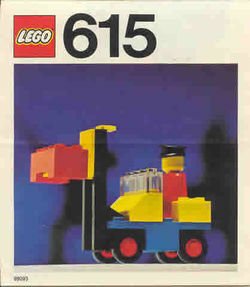 615 Fork Lift with Driver is a LEGOLAND Construction set released in 1975. It contains a fork lift and one LEGOLAND Minifigure. 615 Fork Lift with Driver is the same as set 425 Fork Lift, which was only released in the USA. This set was only released in Europe, UK, Australia, and Canada. Facts about "615 Fork Lift with Driver"
This page was last edited on 12 January 2016, at 21:03.